the sun flowering in the sky. 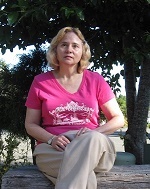 Bobbi Sinha-Morey lives in the peaceful city of Brookings, Oregon, where she enjoys aerobics, knitting, reading, and rock hounding with her husband. Bobbi loves listening to ‘60s music, has an impressive Marilyn Monroe collection, and is a big fan of "Charlie's Angels" and the classic series, "The Avengers.” She is the author of several collections of poetry. Beautiful tribute to your aunt. Jean Colonomos An inspiring poem so full of grace. I love where you take the poem. I had an aunt whom?? her children said was "stuck on happy"! What a treasure she was in the Brushy Mtns of NC. She lived to be 92, laughing all the time...never complaining. I miss her. I loved this poem. I have fond memories of my aunts, now all gone. My favorite line is "Some springs of remembrance, like the ones in her heart, never go dry, they only get riper like the sun flowering in the sky." Love your visuals and palpable smells, Bobbi, but most of all, the love!